Provides UI and functionality to publish files to Shotgun. This document describes functionality only available if you have taken control over a Toolkit configuration. Please refer to the Shotgun Integrations User Guide for details. Primary Output. Items to be published are organized by their output type with the primary output given prominence at the top of the UI. There must be exactly one item to publish for the primary output which would typically be the scene file itself. Secondary Outputs. Secondary outputs are optional and there can be as many as required. Items from the scene (e.g. a mesh in Maya) can also be associated with multiple secondary outputs (e.g. OBJ export together with an Alembic Cache export) if needed. Publish Details. In addition to selecting the items to publish, the interface also allows the artist to choose the Shotgun task (if they haven't already specified this in the current Work Area), capture a thumbnail and add a comment. Launch the app, select the items to be published, choose the Shotgun task, set the thumbnail, enter a comment and then click 'Publish'. The app will perform a pre-publish validation pass on the selected items. If there are any problems it will ask if it should continue. If it shouldn't then it will stop and display the problems, allowing them to be fixed before continuing. If there were no problems or it was told to ignore any problems, it will then publish all selected items, starting with the primary. As long as the primary item is successfully published, the app will finish by running a post-publish step. Typically this is used to version-up the current scene and do any cleanup. Finally the result: Success or Failure, is displayed together with any problems reported by the publish step. Multi Publish has been designed to be extremely configurable with all the key steps being implemented as a series of hooks. As well as separating out all engine specific calls from the app, making it easy to configure for new engines, these hooks also provide complete control over the publish process. hook_scan_scene is responsible for scanning the current scene for items to be published. It should return a primary item together with any number of secondary items. hook_primary_pre_publish is typically where you would validate that the primary item can be published. This can return a list of non-fatal problems that won't stop the publish. hook_secondary_pre_publish is where the validation of all secondary items happens. Again this can return a list of problems that the user will have the opportunity to fix before continuing. hook_primary_publish will publish the primary item for the primary output. Typically this is responsible for copying the current scene file to the publish area and registering it with Shotgun. It should return the full path to the published file which is then passed as a dependency to the secondary publish hook. Raising an exception within this hook will stop the publish and notify the user. hook_secondary_publish publishes the secondary items for the secondary outputs. Again this typically exports or copies the published files and then registers them with Shotgun. 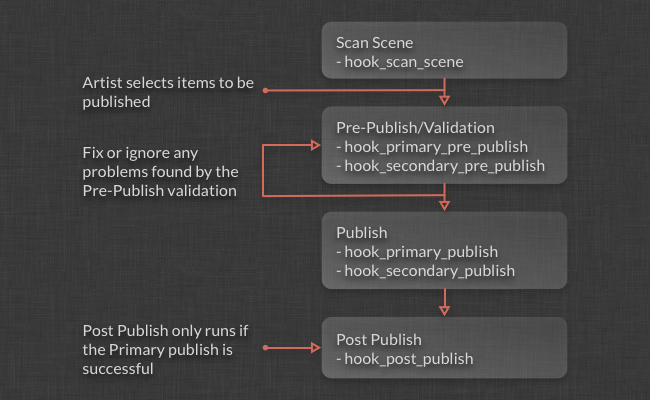 hook_post_publish is the final hook in the publish workflow allowing any clean up to be done at the end of a publish. In the default hooks, this is where the scene is versioned up. This hook will only by run if the primary publish succeeded without raising an exception. These additional hooks can be used to customize the behaviour of the app. hook_thumbnail can be used to provide a thumbnail for the publish in cases where performing a screen capture doesn't make any sense. If this returns a file path to a thumbnail then the screen capture functionality is disabled. hook_copy_file is used to do any disk based file copying of files by the app. The default hooks use a utility method on the app which in turn calls this hook. To do this, call self.parent.copy_file(...) from within the hook. It's important to understand the relationship between the outputs defined in the configuration and the items returned by the scan-scene hook. Each output has a scene_item_type property which is an arbitrary string defined by the configuration. The primary_scene_item_type must be unique. Multiple secondary outputs can share the same scene_item_type. For example, if the two secondary outputs: 'OBJ' and 'Alembic Cache' are given the same scene_item_type geometry, this indicates the intention that all geometry items from the scene should have both an OBJ and Alembic Cache file published for them. Each item returned by the scan-scene hook has a type which must match a scene_item_type for one of the outputs defined in the configuration. The app will combine the list of items with the list of outputs using the mapping between the output's scene_item_type and the item's type and present the final list to the user to allow them to select the items for each output to be published. This tutorial shows how you can configure Multi Publish to export Alembic files when you are publishing groups of geometry from Maya. This document provides a step-by-step tutorial for Technical Directors (TDs) setting up a simple end-to-end pipeline using Toolkit in an advanced way. New Toolkit users who finish this tutorial will understand the fundamental aspects of the platform as well as how to customize it based on their studio's specific needs. The tutorial also provides an introduction to the out-of-the-box Toolkit apps and how they fit together in the artist workflow. Please note that this document describes functionality only available if you have taken control over a Toolkit configuration. For more info, see the Shotgun Integrations User Guide. If you have access to the Shotgun Pipeline Toolkit, you also have access to the source code for all apps, engines and frameworks in Github where we store and manage them. Feel free to evolve these items; use them as a base for further independent development, make changes (and submit pull requests back to us!) or simply tinker with them to see how they have been built and how the toolkit works. You can access this code repository at https://github.com/shotgunsoftware/tk-multi-publish. You need Shotgun Pipeline Toolkit Core API version v0.14.58 or higher to use this. Description: Specify the hook that will actually do the publish of the primary task. This hook is passed the primary task that should be published. The hook is responsible for the entire publish process and should ensure to register the publish with Shotgun. Description: Specify the hook that will be used to do any post-publish work. Typically, this hook will be responsible for versioning up the scene to the latest version. Description: Specify a hook to copy the file 'source_path' to 'target_path'. This hook is used in the 'copy_file' utility function and can be accessed from other hooks by calling self.parent.copy_file(source_path, target_path, task) from within the hook. Description: Template used to locate the primary published file within the file system. If None then this must be determined within the publish hook. Description: This is the type that will be used when registering the primary published file with Shotgun. If not set then this must be determined within the publish hook. Description: A reference to a template which locates a work file on disk. Description: Specify the hook that will run before the primary publish. This hook can be used to perform any validaiton on the primary task that is passed in to ensure that it is ready to be published. Description: Specify a hook to scan for items to publish. The hook should return a list dictionaries that represent the items to be published. Description: Define if an output should be expanable to show the items it contains when there is only a single item. Description: Specify a hook to pre-generate a thumbnail for the publish. Description: Specify the hook that will run before the publish. This hook can be used to perform any validaiton on the secondary tasks that are passed in to ensure that they are ready to be published. Optional thumbnails and fixes for Photoshop CC jpeg exports. Errors when pre-generating thumbnails are now caught and do not prevent publishing anymore. Errors can happen when pre-generating thumbnails, e.g. when trying to create a thumbnail from a huge image in Photoshop. However, users can always add a thumbnail with the screen shot button. This fix considers pre-generated thumbnails as a "nice to have" feature, and allow publishing to keep going, even if thumbnail pre-generation fails. Photoshop CC publish hooks now leverages export_as_jpeg and generate_thumbnail methods from tk-photoshopcc engine for thumbnail generation and Version publishing, if these methods are available in the installed tk-photoshopcc engine. Using these methods in Photoshop CC fixes some problems when generating jpeg thumbnails or jpeg images used when creating Versions in Shotgun, which could prevent a publish to complete. Furthermore, in Photoshop CC, errors when creating a Version in Shotgun do not prevent a publish to complete anymore. Compatibility with Hiero/Nuke Studio 11. Better handling of unicode file paths during pre-publish validation. Switches to writing jpg for thumbnails instead of png. This stops further libpng errors mentioned in v0.10.2 release notes from occurring. [minor] UI layout tweaks to address further visual quirks discovered during v0.9.5 testing. [minor] UI layout tweak to address visual quirk in Maya 2017 on Windows. [minor] Removes log_error call that was in place for debugging purposes. Properly supports changing contexts on the fly. QA Fix: Verifies that 3ds Max writes the .abc file to disk before publishing. 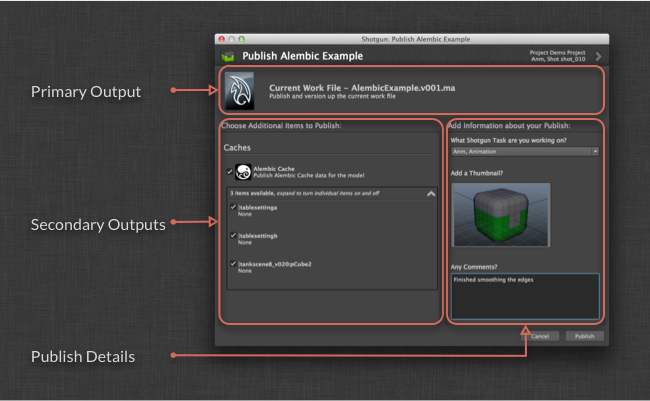 Adds support for Alembic cache publishing for 3ds Max 2016+. Bug fix for Nuke Studio support in the tk-nuke scene operation hook. Hotfix. Bug in conditional in primary publish. Adds user_data argument to hooks for sharing a dict of data between them. The user_data dict is passed to all hooks when they are executed. This dict is shared across all hook executions and, as such, can be used to store data in within a hook that can then be accessed from subsequently run hooks. Because this is a new argument being passed to each of the hooks, it's possible that custom hooks will need to be updated to accept the additional argument. That being said, tk-multi-publish hooks are all setup to accept **kwargs out of the box, so unless that has been explicitly removed from a custom hook there will not be any problems. Merges Hiero hook operations into Nuke hooks. Changes necessary to allow the tk-nuke engine to work within the Hiero mode of Nuke 9.0+. Fix to unicode strings causing Houdini operations to fail. This change implements a workaround for a rare bug where publishing flattened channels that contain only a single layer could crash Mari. Adds .psb support in Photoshop. This release adds Photoshop PSB support. In order to save your Photoshop scenes as PSBs, simply update your templates.yml file entries for Photoshop (photoshop_shot_* and photoshop_asset_*) to use the extension .psb. Note that you won't be able to use .psd and .psb at the same time for the same entity type. Also, you need the tk-photoshop engine's version to be greater or equal to v0.3.0. Finally, you also need tk-multi-workfiles to be updated to v0.6.7. Previously, the colorspace was not being passed through from the Write node so if it was set to a non-default value, the rendered movie would be wrong. Added support for the new 3DS Max Engine supporting MaxPlus and Max version 2015. Fixed issue with Mari publish permanently flattening channels! Items returned from the scan-scene hook that don't match a secondary publish type defined in the configuration are now ignored. Previously an exception would have been raised. Details: If read nodes in the current script have their file knob set to "" by a script, this will return None when reading the file knob value back which causes an error when trying to replace the path separator. This fix checks to make sure we have an actual (non-empty) file name before continuing on to try and match it with a template. If the file_name is an empty string or None, we skip the check and move on error free. Primary pre-publish errors are now displayed in the UI. Details: - Previously, the user was informed that there were errors but the actual errors were never displayed - this has been fixed! Details: - Added a new setting to allow 'No Task' selection for publishes when the current context doesn't specify a task and the pipeline supports task-less publishes. - Added a second per-item progress bar for publishes when there are more than one item being published. - Fixed some issues with the progress reporting where the progress bar wasn't behaving correctly. - Updated hook to use the latest interface. Fix for PyQt 4.6 compatibility. Details: Fix for PyQt 4.6 compatibility. Adjustments to the Photoshop Publish Support. Added Photoshop Support. Various Tweaks. Added Photoshop Support in hooks. Improved Nuke Review Submission Functionality in Hooks. Minor changes to the nuke export hooks UI formatting. 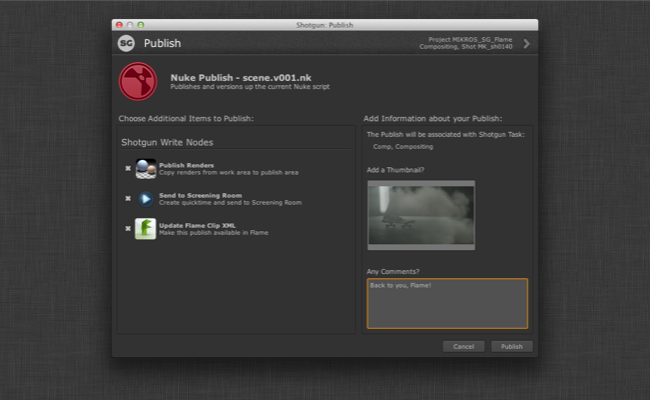 Added default Review Submission to Nuke publish hooks. Added Hiero and Houdini Support. Minor tweaks. Updated to use the configured Published File Entity type. Fixed a spelling mistake in a configuration file. Configuration changes - the primary output is no longer stored in a dictionary. First non-preview release to the Tank Store. Initial Release to the Tank Store. and I'm manually checking in the scan hook if they are available in the config. What about having an entry in the publish config to add other templates than the primary and secondary publish templates? Those will be checked when starting the app and the app won't show up in the menu if something is missing. Is there someone else doing/needing that or am I doing something wrong with my templates? You're not doing anything wrong and this is indeed a missing piece of the puzzle! I agree that it would be great to be able to specify the templates that are used in the hooks (outside of the ones in the configuration) so that they can be validated at startup of the app/engine/etc. I'll add this to the list to be discussed internally and add a feature ticket if the others agree. Out of curiosity, is not having this causing you problems or is it just a nice-to-have to help avoid future problems? I like the register_template idea in the hook class. Will this trigger a check at the app initialization or only when you call the hook? I would prefer the former as it would tell me I'm missing the templates before trying to run and fail any publish. It used to cause me errors with the old Tank (pre v0.13 ) when I was jumping from project to project with different configs, hooks and apps. But it was mainly bad version tracking on our side. It's not the case now because I'm properly checking for the templates in my scan hook before anything. After discussion we agreed that being able to add the templates to the configuration (with the hook) would be best as this would allow validation without running hook code. I've created an internal ticket for this and we'll try to get to it soon. I've added it in the code and it'll go out with the next release. How Can I ** fix error 53 on iPhone 6** using this tool? Can you help me please. Is it possible for secondary publishes to have more than one level to expand to in the ui? Basicaly like a tree view, like in the Loader. Example, In Maya I have a group of object called "Table_Group". I like to be able to show the group in the publish ui and then drill down into it and only publish the "Desk" as a Alembic file. I don't want to just list all objects, since this clutters the ui quickly.